Harmony has partnered with Texas Tech University Health Science Center in educating our students in the various careers in the medical field. Students will also receive information to help get them started on a medical career pathway. 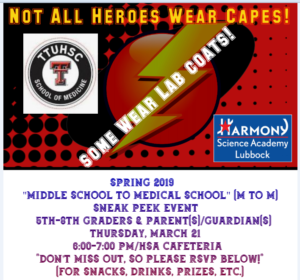 All 5th through 8th grade student and their parents are invited to attend March 21st from 6:00 to 7:00 p.m. All students attending will receive a free dress pass.